Recent polls have shown Team Blue expanding their generic ballot advantage in the aftermath of Brett Kavanaugh’s confirmation — with their lead swelling to double digits in surveys from Morning Consult and Ipsos. As of this writing, FiveThirtyEight’s poll aggregator suggests that Americans prefer a Democratic Congress to a GOP one by an 8.2 percent margin – up from 7.7 on October 5. And yet, over roughly the same period, Democrats’ prospects for taking the Senate have gone into bad decline. After leading in a majority of polls taken over the summer, former Democratic governor Phil Bredesen trails Republican congresswoman Marsha Blackburn by eight points in a CBS News/YouGov taken early this month — and trails her by some 15 points in an Upshot/Sienna live poll of the race (which is technically unfinished, but already has a statistically significant number of respondents). Other red-state Democrats are suffering a similar fate. The last two polls of North Dakota’s Senate race have shown GOP congressman Kevin Cramer opening up a double-digit lead on Democratic senator Heidi Heitkamp. And the Supreme Court might well have driven a nail into the coffin of Heitkamp’s Senate career. North Dakota does not require voters to register with the government, and thus, somewhat justifiably requires voters to present identification at their polling places. But (entirely unjustifiably) the state recently passed a law that requires voters to present an ID that includes a residential street address — not merely an in-state post office box. This rule effectively disenfranchises a wide swath of the state’s Native Americans, many of whom live on reservations, and thus, lack residential street addresses. A federal district court had halted implementation of the law, out of concern for its discriminatory impact. But the Eighth Circuit Court of Appeals stayed that court’s order in September — and this week, the Supreme Court opted to let that be the last word on the matter. As a result, roughly 70,000 (disproportionately Native American and Democratic-leaning) North Dakotans will not be legally allowed to cast ballots in November. Now, with Republicans boasting a clear advantage over Heitkamp and Bredesen, Democrats can no longer take the Senate merely by winning every “toss-up” race on the board. Rather, to gain the majority, the party will need to win tight races in Arizona, Nevada, Montana, Florida, West Virginia, Indiana, and Missouri — while pulling off at least one major upset in North Dakota, Tennessee, Texas, or (more improbably) Mississippi. 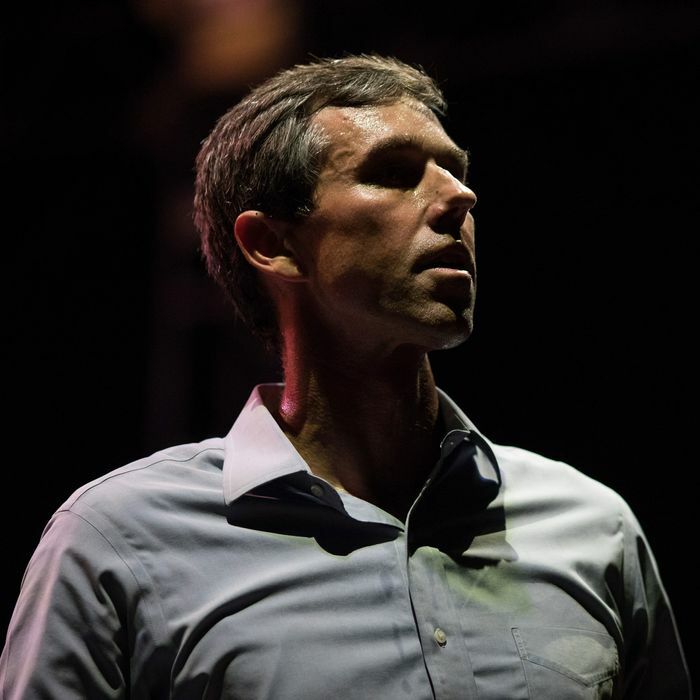 And the latest survey data suggests that Beto O’Rourke won’t shift the Lone Star State out of Cruz control. A Quinnipiac poll released Thursday puts Ted Cruz’s lead in the Texas Senate race at nine points (up from six in July). What’s more, while Republicans are gaining the upper hand in many “Trump state” battlegrounds, Democrats haven’t done the same in the lone Clinton state one: The two most recent polls of Nevada show incumbent GOP senator Dean Heller with a thin lead over Democratic congresswoman Jackie Rosen. Notably, in Nevada, Texas, and Florida, Donald Trump’s virulent nativism has not prevented his party from retaining a hefty share of the Latino vote. In Texas, Quinnipiac has Ted Cruz taking 37% of the Hispanic vote. In Nevada, NBC/Marist has Dean Heller getting 38% and NYT/Siena has him getting 39%. All this prompts the question: Why has the Democratic Party’s outlook in Senate races darkened, even as its advantage in the generic ballot has held steady or improved? There are several plausible to answers this query. One is simply that our underlying data-set — polls taken in the last couple weeks — is rather small, and thus, might be giving off more noise than signal. According to this theory, as more survey data is collected in the coming weeks, the disparity between the Democrats’ national poll numbers and their performance in key Senate races will narrow (one way, or the other). Another explanation is that Kavanaugh’s confirmation process polarized the electorate in a manner that benefits Democrats nationally, but hurts them on the 2018 Senate map’s overwhelmingly red terrain. This week, a CNN poll suggested that the Kavanaugh hearings had done more to increase enthusiasm among Democratic voters than Republican ones — a development that allowed Team Blue to open up a 13-point national lead in said survey. But while a majority of Americans found Christine Blasey Ford more credible than Kavanaugh — and at least a plurality oppose the latter’s confirmation to the Supreme Court — white Americans without college degrees took the opposite view in overwhelming numbers. And North Dakota and Tennessee are home to many such Americans. Alternatively, it’s possible that Republicans are simply coming home to their party as the election enters the homestretch, and would have done so even in a universe where the Kavanaugh imbroglio never happened. After all, Heitkamp and Bredesen were both losing ground before Christine Blasey Ford’s sexual-assault allegations became national news. All this said, FiveThirtyEight’s forecast still gives Democrats a roughly one-in-five chance of taking the upper chamber. This is largely because, nuances of individual races aside, there is a fair amount of correlation between their results. Which is to say: If pollsters are systematically underestimating Democratic turnout nationally — and the party’s true generic ballot lead is not 8.2 percent but closer to CNN’s 13-point figure — then there’s a good chance that each and every Senate race is much more favorable to Democrats than present polling suggests. So, there’s still a chance that Beto & Co. could end Mitch McConnell’s reign as Majority Leader next month. But I wouldn’t bet my democracy on it.